MOSAIC allows for multiple displays to be attached to a single X server to create a unified Workspace. MOSAIC is enabled by different options in the Screen section of the xorg.conf file depending on the system configuration. Note only one Screen needs to be defined with MOSAIC. Option         "MetaModes" "1920x1080 +0+0, 1920x1080 +1920+0, 1920x1080 +0+1080, 1920x1080 +1920+1080"
§ 2 to 4 identical GPUs - MOSAIC is enabled using a combination using a combination of the "BaseMOSAIC" and "MetaModes" options. Option        "MetaModes" "GPU-0.DFP-0: 1920x1080 +0+0, GPU-0.DFP-1:  1920x1080 +1950+0, GPU-1.DFP-0: 1920x1080 +0+1100, GPU-1.DFP-1: 1920x1080 +1950+1100"
§ 2 to 4 GPUs with Quadro Sync - MOSAIC is enabled using a combination of the "SLI" "MOSAIC" and "MetaModes" option. As additional step is also required to enable framelock on the Quadro Sync card. Option        "MetaModes" "GPU-0.DFP-0: 1920x1080 +0+0, GPU-0.DFP-1:  1920x1080 +1820+0, GPU-1.DFP-0: 1920x1080 +0+1000, GPU-1.DFP-1: 1920x1080 +1820+1000"
Most Window managers will override the NVIDIA settings - so although MOSAIC is enabled the window manager still detects separate displays attached. To correct this behavior you need to add the following option to the Screen section. In some cases the "RANDR" extension has to be disabled in order to see a single Desktop. The MetaModes are defined from the top left of the screen - +0+0 will be top left. Each display entry is offset by a horizontal and vertical values. Bezel correction can be added by increasing the offset values. In example below a 30 pixel horizontal and 20 pixel vertical bezel correction is added. Option         "MetaModes" "GPU-0.DFP-0: 1920x1080 +0+0, GPU-0.DFP-1:  1920x1080 +1950+0, GPU-1.DFP-0: 1920x1080 +0+1100, GPU-1.DFP-1: 1920x1080 +1950+1100"
Overlap correction can be added by reducing the MetaMode offset such that the one display overlaps with the other. Option         "MetaModes" "GPU-0.DFP-0: 1920x1080 +0+0, GPU-0.DFP-1:  1920x1080 +1820+0, GPU-1.DFP-0: 1920x1080 +0+1000, GPU-1.DFP-1: 1920x1080 +1820+1000"
Additional Steps for Quadro Sync + "SLI" "MOSAIC"
After X has been restarted framelock has to be enabled on the Quadro Sync card. 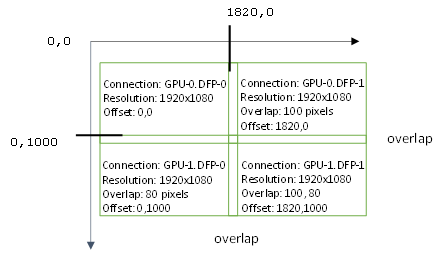 Open nvidiia-settings go to "Frame Lock"
The displays will now be synchronized. 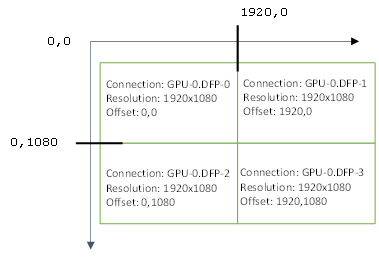 Note: nvidia-settings are not automatically applied when X is restarted. Refer to the Linux README file (R340 readme) on information on how to script the framelock startup and add the script to ~/.xinitrc file or directory . 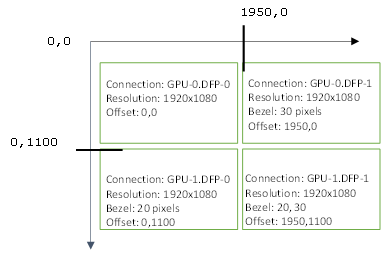 Which NVIDIA NVS GPU support Mosaic?